This is a backup of the interview. 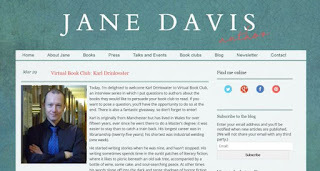 Today, I’m delighted to welcome Karl Drinkwater to Virtual Book Club, an interview series in which I put questions to authors about the books they would like to persuade your book club to read. If you want to pose a question, you’ll have the opportunity to do so at the end. There is also a fantastic giveaway, so don’t forget to enter! Karl is originally from Manchester but has lived in Wales for over fifteen years, ever since he went there to do a Master’s degree: it was easier to stay than to catch a train back. His longest career was in librarianship (twenty-five years); his shortest was industrial welding (one week). He started writing stories when he was nine, and hasn’t stopped. His writing sometimes spends time in the sunlit patches of literary fiction, where it likes to picnic beneath an old oak tree, accompanied by a bottle of wine, some cake, and soul-searching peace. At other times his words slope off into the dark and tense shadows of horror fiction, and if you follow them you might hear chains rattling behind locked doors and the paranoid screams of the lost echoing in the distance. There is no obligation to enjoy both of those avenues. His aim is to tell a good story, regardless of genre, but it always comes down to life, death, and connection. Q: Karl, perhaps you can start by telling us how you came to be a writer. I grew up in Manchester, a place I love and hate. My father died when I was a child and we moved around a lot. New schools, new houses. I found it hard to keep making new friends so retreated into books and fell in love with story-telling. There were other worlds I could visit as I read at the top of the weeping willow, or underneath my bed by torchlight. Then I discovered that I could make my own worlds too and began writing stories and poems, often quite dark juvenilia. They were published in school magazines and that made me happy. With the exception of English, where I always got top marks, I was a rebellious and problematic child, unhappy and worried about my family. I experienced my first bouts of depression, a mental state that has been my occasional companion in life. Then I went to a further education college and it turned my life around. I learned to love studying – not because I was told to, and punished if I didn’t, but because I wanted to learn. I studied extra subjects and went to night school too, despite it meaning I was sometimes in college for twelve hours. I became the first person in my family to go to university and eventually got first class honours in English and Classics (specialising in Ancient Greek language). I moved to Wales, achieved an MSc in Information Studies, and became a university librarian. All this time I kept writing. And every year I would look back on my older work and see its flaws, learn from them, and continue writing new stories. Around ten years ago I wrote my first novel in lunchtimes while working full time, the only way I could fit it in around all my other commitments. I now have three novels to my name and have left the library job (after twenty-five years) to immerse myself in what I love: writing. Q: What is it about writing that means you’d leave a steady job? Writing is something I have to do. It’s a compulsion, a desire, a way of communicating, of getting things out of myself, of trying to create something of value to other people. That drive keeps me going on days when the words don’t flow. Q: What kind of thing do you write? I do what authors are told not to do – switch between genres. Some of my work is literary/contemporary, stories about life, death, love and relationships. Other stories are horror. Yet I see the difference as just being one of tone. The elements I focus on are the same. Your best writing will always be writing you love and stories you feel compelled to tell. Regardless of what niche a particular work falls into my aim is always to tell a good story. Q: The novel we’re going to focus on today is 2000 Tunes, and it’s a literary/contemporary novel- which is how I describe my own fiction. Where is your book set and how did you decide on its setting? It’s set in Manchester, and a key subplot is about the two protagonists coming to realise that Manchester isn’t the place they once thought it was. Sometimes reality pushes through the dreams and you decide it is time to move on, an obvious metaphor for growing up. The other element of the setting is that it’s based in the year 2000. A time when people thought the world might suddenly change for the better. We all know how that worked out. But it’s an interesting liminal time, totally appropriate for a coming of age story about a music-obsessed Manchester man and an over-indulging Welsh woman choosing reality over the dream. 2000 Tunes is a partner to my previous novel, Cold Fusion 2000, which was also set in Manchester in 2000. The two novels have similar themes, crossover locations, and nerdy male characters with their own obsessions (Cold Fusion 2000’s Alex was an über-geek FE lecturer obsessed with physics and poetry). I think these two novels were getting something out of my system, purging me of my mixed feelings about the place where I grew up. Location, location, location. Since both novels were set in a very real place I wanted to reflect that, and show how the geography of an area affects our perception of it. The difficulty was that the city centre had changed a lot in the last fifteen years. Many of the places in the novel have already been lost, renamed, altered or closed. 2000 Tunes opens outside The Haçienda, one of the world’s most famous nightclubs: just before it was demolished for luxury flats. I had to combine my memories of the city at the time with archival photos and discussions; my diaries were useful too. I built the city back up as it used to be and then let the characters breathe into that space. Q: Do you feel under pressure to make your main characters likeable? That’s an interesting question. I primarily try to write characters that are believable. That means they have to be flawed in some ways. But the flaws can’t be so repugnant that the reader loses sympathy; and if a story is a journey then they have to change during that journey. I remember one reviewer saying they hated Alex (the protagonist of Cold Fusion 2000) at the start of the novel – Alex is a self-obsessed, pretentious nerd who is unable to communicate with anyone properly (it was an irresistible irony for me to make him a teacher). Yet by the end they understood him and felt sympathy, even if he never became fully likeable. It’s that mix of qualities that makes someone believable. Samantha (the Welsh woman from 2000 Tunes) makes bad choices and is prone to addictive behaviours, but no-one can say she doesn’t have heart and spirit. Even in my first novel, the survival horror Turner, the main character has that mix – some selfishness, anger and a foul mouth that repels people; yet also the strength to defend others and the willingness to risk himself to do it. Even anti-heroes have to be likeable in some way, or the reader will turn off. Q: What’s your favourite / least favourite aspect of your writing life? Favourite: being at home with the cat, then becoming lost in a story or scene; the rare occasions where it comes to you so vividly that you are really there. Least favourite: rewriting. There is none of the excitement of discovery of a new work; none of the near-completion feeling that comes with final edits. It is entering the Bog Of Eternal Trudging, unaware of when you will emerge. When I wrote my first novel I decided the end result wasn’t quite good enough so I put it aside. I came back to it years later and entirely re-wrote it (even switching from first person to third person). Although I had really wanted to give up and move on, I knew I would learn more by fixing something that wasn’t working. Every element was inter-connected: altering a character meant adjusting the plot; removing a scene meant adding foreshadowing elsewhere. After separating the engine’s parts and reconnecting them – and replacing and polishing and refining – I learnt a huge amount, including how to avoid making those mistakes again in the future, and how to cut words without regret! But was it fun? Generally not. Q: That’s really interesting. I have done exactly the same with one of my novels. There is no simple change. Each one has to be carefully woven through to see what impact it has on the rest. Can I ask, what are you working on at the moment? A few collections of short stories. Over the years I’ve written a lot of shorter works, sometimes published, sometimes just lurking on my hard drive where they breed at a prolific rate in the gap between folders. In 2015 one of my pieces was included in an anthology of UK short stories, Secondary Character. The anthology was a great way of bringing writers with various styles and interests together, but illustrating that we all had the same goal – to communicate something to our readers. Different paths to the same place. It also reminded me that people do love short stories, which can offer great variety between two covers, a kind of snack between meals. The other factor in my decisions to put my new novels on hold was NaNoWriMo (National Novel Writing Month). I took part for the first time in 2015, and although it was tremendously hard work I succeeded in writing over 50,000 words in November. It involved dedication, endurance, and late nights, but the sheer pleasure and excitement chased away tiredness. The intensity generated new ideas, the pressure pushed me to work harder. I’m currently editing the stories, then they’ll go on to beta-readers, then my literary editor and proofreader. If all the feedback is good they’ll be available this year. Q: So when is a short story too long? Like any work, if it has unnecessary padding, it is too long. The end goal is to be read, and for our readers to gain something positive from the experience. The tighter you wring it, the leaner it is, the more that lovely muscle tone shows through. I’m learning to play the guitar, and most weekends get together with friends for a drink and to play music. One plays drums, one sings, two share bass duty. Our band is called Organic Apocalypse and I’m hoping we’ll do our first live performance this year. I also like exercise, running, bits of yoga. I play computer games and board games. I read all the time. I did pole dancing for a while but decided that I didn’t look respectable enough in hot pants. I spend a lot of time worrying about the world, the environment, population, wildlife, and how humans should be treating the planet where we’re guests. That may make me a typical vegan. Q: Names in a hat. Karl, you’ve very kindly provided some fantastic prizes for a giveaway. All readers need do is leave a comment. Rather than first first served, I think everyone should have a chance at winning, so we’re going to put the names in a hat and have a grand draw. The winners will be notified by email. My blog is the primary place where I chat and muse (editor’s note: this is also where you’ll find links to buy the books). I can also be found on Facebook, Twitter and Goodreads, and welcome contact from my readers in whichever medium they use.